Parius To Bring “The Eldritch Realm” To America’s East Coast! For as chock-full of incredible music as 2018 has been, Parius‘ The Eldritch Realm remains a stand-out. For the uninitiated, it’s a brisk little number jam-packed with ferocious riffing, BTBAM-levels of complexity, unapologetically fun grooves, and a soupçon of Zapp Brannigan-esque narration. 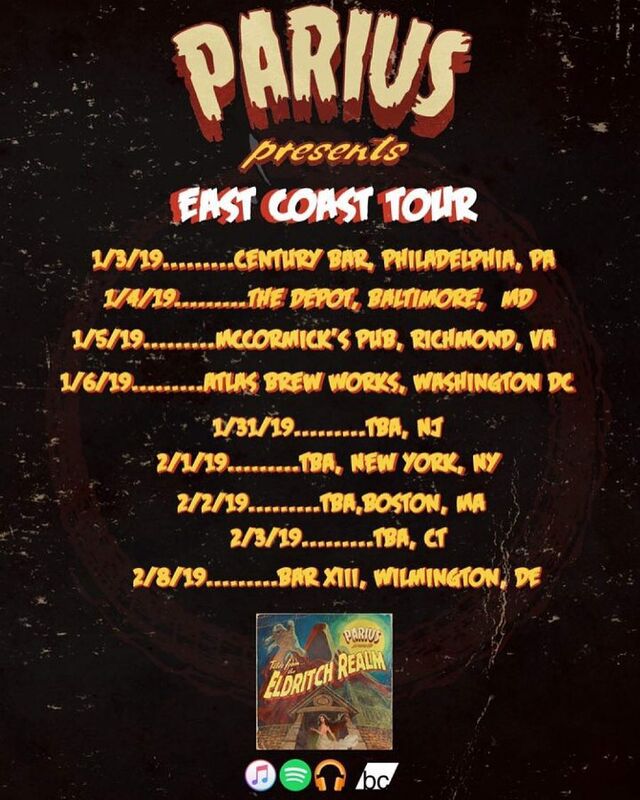 If you haven’t heard it yet, check it out and get excited with the rest of us: Parius are going on tour along America’s East Coast! 1/6- Atlas Brewery, Washington D.C.
As promised, here come the links! You can and should follow Parius on Facebook, Bandcamp, and Instagram! Jud Widing is a US-based author whose work has appeared in Star 82 Review, Storgy, The Offbeat, Suspense Magazine, and more. His fourth novel, "The Little King of Crooked Things", will be released in early 2019. Next PostCurrents - "I Let The Devil In"